WEBINAR 1: What are your modernization initiatives? You have a content re-engineering initiative. Now what? Do you have an IT re-engineering or modernization initiative? As you rationalize your software licensing and maintenance and your content storage solutions, this is an opportunity to take a close look at report output management, correspondence and customer communications. What tools do you have in place that support this? Do you have overlapping capabilities, heavily customized tools or manual processes? 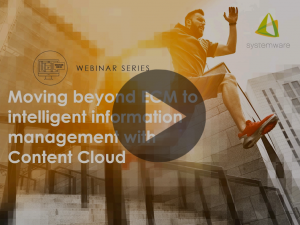 In this webinar, discover how Content Cloud can help you meet your re-engineering initiatives and provide a productivity-driven user experience. *Submission of this form means you consent to receive electronic communications from Systemware. What if you could find and extract data wherever it is stored and transform and deliver information in the context needed? You can with Content Cloud.